Today I am reminded again just how remarkably tone deaf leaders of companies can be. 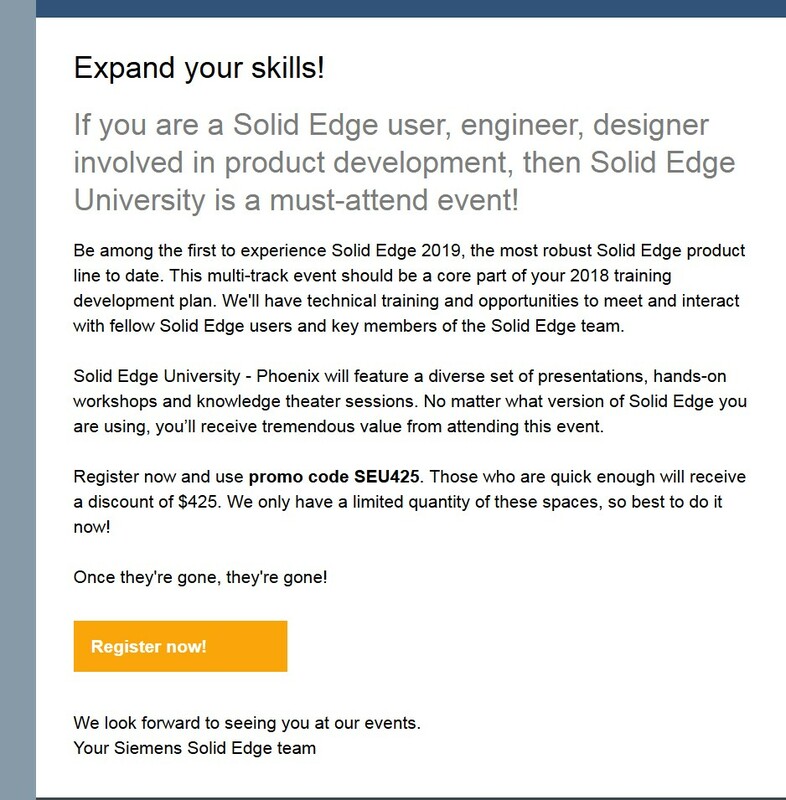 This morning I get a “hurry it’s your last chance” email regarding PLM Connection and the Solid Edge University which resides in it this year. Now I don’t know if you can attend this marvelous event just for the SE agenda but I suspect not. How Could You Refuse This Deal? I like the limited seats comment too since I have experience that says it will literally be one room out of the dozens set up for the UGS side. So yes severely limited is the literal truth. Now before you get all over excited and are frantically scrambling for your credit card in a frenzied burst of SE enthusiasm calm down and see what you will get for your dough. I completely resent the cavalier way Siemens has decided to treat it’s SE users and to clearly indicate once again that the red headed step child is someone they hide from themselves and the public. At PLM Connection they will sit in the isolation chamber down the hall in a room where it is grudgingly admitted that yes the DNA says Siemens but darned if we are happy about it. You UGS people disgust me with the way you scheme and maneuver to hide a product you are afraid of competing against. Unable to compete based purely on capabilities and pricing they sabotage the SE ecosystem and starve it into submission. Can you believe they have the unmitigated gall to charge you full three day event price for one day of stuff that is pretty well useless to most SE users? I sure can and remember with extreme disgust dealing with these idiots and the PLM World mindset. They are God and you are the distasteful stuff on their shoe sole to be wiped off when hopefully no one is looking to observe this. I do have to say though that in fairness to myopic management they have some justification for sending their Grindstaff smother SE henchman John Miller over there to do a job on SE and the University. As users the SE people were given a real chance under Karsten Newbury and Don Cooper to show the world and UGS/Siemens that there was interest in the SE University. For some years running users as a percentage that showed up was pitifully small and to be honest if I were over deciding to do these things and not dedicated to the idea of building a community I would kill it off to. Either the SE user base is FAR smaller than I think or for some reason the ones willing to show up percentage wise are far smaller than say SW or Autodesk. In any case you reap what you sew and I blame primarily the UGS Cabal but users that don’t support anything should not expect to get anything either and by repeated years of no shows the excuse needed by Siemens UGS Cabal (Have you noticed I love saying this? These contemptible people deserve to get raked over the coals at every opportunity and since this is my blog I do so.) I suppose SE users are back to the 36 people total attendance at the premier Siemens software event. A towering monument to Siemens/UGS corporate stupidity that excels in back room skullduggery. I have to wonder how things could be if armies of corporate drones were not solely devoted to CYA and turf protection and useless make work meetings to plan the next meeting spent this same time and energy improving the product and growing market share to where it could and should be. I notice with interest that Dassault has finally admitted that even though they would love for you to buy into their overpriced over complicated Catia ecosystem there are many millions of CAD users that have A, no interest in the cloud and B, no interest in spending tons of money for un-needed complexity that does nothing but make their lives more expensive, less productive and operates levels of complexity way beyond what they need CAD for. So this year they have reversed years of we don’t like you and want you to leave SolidWorks by agreeing to spend four times the money and buy what we like and not what you like. They have committed to the idea that SW users are a force to be reckoned with and respected and desired. Now time will tell the real tale but today they say this. Siemens/UGS (you know what they are ;D) has never to my knowledge given more than passing notice of the cloud only as an ecosystem you would have to work in nor have they seriously thought about ending perpetual seats as far as I know. Unlike the complete fool Andrew Anagnost at Autodesk. Who in combination with hostile board members deciding that users are not customers but rather they are chattel to be extorted in ever greater ways and the concern is purely for how to forcibly raise more money from existing customers. The idea of mutual benefit as a business model has ended with these people but I can honestly say that is not true with SE since it is powerful design software that is improving and is still rent or buy and a darned good tool in the tool box in spite of the, well you know who. But anyway the last five years have been interesting and from this software customers viewpoint a real exercise in corporate disconnect from the people who happen to pay their bills and salaries. It is not your corporate investors nor is it the stock market and mutual funds. It is people like me and companies large and small that hired you to make THEM more productive and they do not believe they exist just to make YOU fat and happy. Autodesk is learning right now what happens when you jettison this basic business principle going into their 13th straight down income quarter in a row. May I recommend to you the best software you have never heard of? You won’t hear this from Siemens but I can tell you after years of use it is the best mid range MCAD deal out there. If you are silly enough to still be agonizing over what to do with Inventor and don’t want to be forced into Fusion360 I can say SE is a fine place to go. Being a Red Headed step child is not so bad when I think of productivity and this SE excels at. As a snarky aside here I do have to admire Andrew Anagnosts ability to pare things down. He has eliminated 23% of Autodesks staff. He has eliminated profit margins and he is eliminating gobs of customers. One of his current fascinations is replacing people with artificial intelligence. I ponder the idea of considering his job and if Artifice could be replaced with Artificial. I mean could a robot do any more harm than he is? Plus they could hire an H1-B dude to program the new boss and what a wonderful world this could be. Read this duplicitous garbage I was sent today. Words have meanings. Intent has meaning to. These words say to me here is the lipstick on the pig now don’t you feel better? Please ignore that squishy goopy brown stuff you are laying in with the glamorous pig. Here let us spray a little “Eau De Verbiage” parfummy and the idiots will think what stinks really does not. 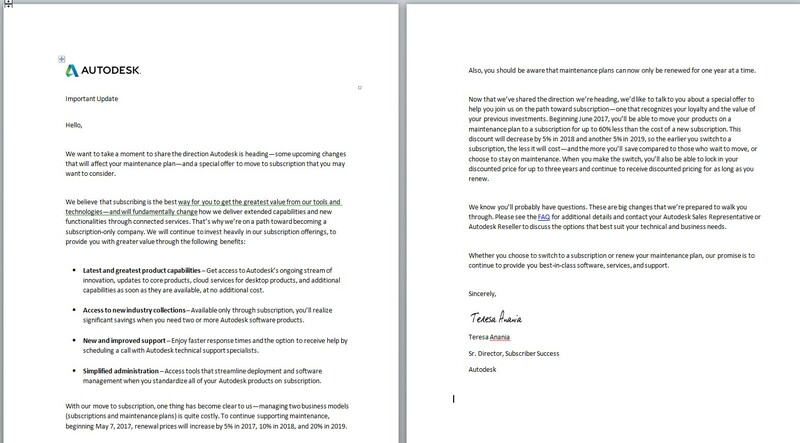 Let me extend an offer to you Autodesk in plain speaking words. I too have a profit picture and outgo equals less profit for me. I am not in business to make you succeed at my expense. I am in business to make MY profits grow and you were hired to assist in this because you offered good value for the money at the time. What is happening now is the acceleration of the slowdown of new features and the increase of problems with unfinished new features and legacy problems that apparently are not going to be fixed. EVER. I am also not willing to become a data hostage to people who clearly do not care about my profit margins or security agreements I have to sign with my customers. So my offer to you is for you to go get screwed. I am not at all interested in sending money to thieves and liars which you guys clearly are. So much for the promise of perpetual seats going forward and thanks for the complete education in corporate treachery this little notice of yours brings. You people who consider Autodesk for anything in their little subscription world have to be crazy. I can’t wait for these ethical geniuses to demonstrate cost creep to all those silly enough to become captives. To all the people who work with HSM. Please understand I am not unhappy with you. While some things are slow to be fixed or improved HSM is a proven money maker in this shop. I wish most fervently neither you or I were in this situation but we are. I came here strictly for HSM and intend to continue using it well after your mercenary lying money grubbing corporate overlord execs run it all into the ground. Good luck guys and start building a way out if things turn ugly. You may never have to use it but at this rate I would not count on that hope. For those of you who have followed me for some years now here is an update on the future of this blog. I received the two final codes today on my Hass VF4 and TL-2. Paid them off early and will type in the final numbers today when I finish this post. The frequency of posts has dwindled significantly over the last year. Good things to talk about are far outweighed by the bad these last few years. HSM was the ray of light in a world getting darker until I decided it too was going to become a victim of corporate suit types whose interests differ from what I as a customer expect. Bear with me here as these seemingly disjointed comments will lead somewhere. I will be going to Dayton Ohio for a short job soon and hope to visit one of the old time SE users. He has been using Solid Edge 20 since it came out nine or ten years ago and has not felt compelled to move forwards. The shop has current technology CNC Laser and bending capabilities and they do just fine with software this old. They did not move forward because what they needed was not being incorporated into SE. Now I don’t know exactly why but this guy is a sheet metal wizard so there are reasons. Personally I think the pinnacle of rapid improvement in SE was achieved at ST6 or 7 but then I am a complete direct editing guy and still to this day SE can’t do in Synchronous Sheet Metal all the things the Parametric side can. So whats your point Dave? It simply is this. When you reach a certain level of competency in your software and when you have certain levels of capabilities locked into your physical plant what more do you need to function for many years? HSM brought Adaptive to the world as the best then and now high speed tool path. I bought my mill with this in mind. It was the most profound advancement in milling since I have been cutting chips some fifteen years ago. But I do not see anything coming down the pike like this anytime soon. Nor do I need to acquire a faster spindle or IPM cut speed considering the cost to do so. Like many shops Fieldweld is not a production facility where the very last second saved is critical. So truthfully I can cut with current permanent seat software that will push my machinery to it’s fullest capabilities and never spend another dime. Unlike subscription fools I can do this for the next ten years or so and NOT SPEND ANOTHER DIME. I can’t be made into a hostage nor can I be forced to work online. I have all I need. Now this of course gripes the heck out of software companies like Solid Edge and Autodesk. Where for some reason I am to give money to them each year just because they have bills to pay. Where in Autodesk’s case they now want it to be involuntary and forced forever if you foolishly go there. The problem for both companies begins with the lack of desire to hire and fund enough quality coding to advance the product in ways that benefit customers enough so they WANT to spend more money with them. SE still offers permanent seats but incremental improvements and not ground breaking ones. I still recommend you get SE if you don’t have it. For those who have been here for some time though where is the new cheese? Why should I pay for software that does not bring improvements to MY bottom line. I don’t give a rats hooty about SE or Autodesk’s bottom line. I care that what they have to sell benefits ME and compels me to spend money with them because my profits will increase doing so. These days appear to be over and I don’t expect Autodesk to do anything with HSM this year that will compel me to renew next year. I wish they would but don’t think it will happen. As far as I am concerned if these software companies stop bringing new benefits to the table I need I don’t care if they survive or not. The answer to future innovation in Autodesk’s case seems to be to do away with big chunks of it by the creation of a chattel subscription model which I most earnestly hope fails in a spectacular way. It is a rotten and evil way to make money. So, I think about all this and think about what I need and what interests me. Do I want to blog about companies that offend me with bad business models and a dearth of interesting innovations to talk about? Do I want to make videos that demonstrate software I no longer support financially for good reasons? The departure of Carl Bass from Autodesk does not help either and I think it is bad news. Is it any wonder why private CAD and CAM bloggers have dropped like flies these last five years or so? We do this because we like the software and want to talk about it and the world it works in. A form of insanity I suppose to get this wrapped up in a tool but many of us chose to do so in years gone by. One can be offended for only so long before the love of the tool goes away and that is where I find myself today. In complete agreement with the many bloggers I used to read who quit blogging because they got tired of being offended and wondering when my time will come to. At this rate it won’t be to much longer. Sitting here and thinking today about the world of manufacturing software and coming to some sad conclusions. It is not limited to this sector exclusively either as basic things like Email and Microsoft Win 10 OS problems are growing. I think there is a cycle of innovation and periodically it waxes and wanes. Today we are in wane mode. Thinking of Microsoft trying to create the equivalent to the Apple walled garden where in time they can force users to do what they want as their main new innovation. Their goal I believe is to force all who go there to rent all software each and every month rather than buy an OS and use it for years as is done now. Their innovations will head in this direction and so you see chaotic Win10 stuff and all the IT people whom I trust say don’t leave Win7 if you don’t have to. These companies really resent you buying something once and using it for years and it is at the top of their to do list to end this. There are problems that accompany this effort for users. I can’t surf the web anymore with either Firefox or IE 11 without recurring problems that never existed so frequently before. Sometimes Firefox works better and then sometimes IE works better. Sometimes site functions work right and other times it is 404 city. Check in later and it works. Software is becoming to complex and companies to cheap to hire sufficient talent to correct the problems so they grow. If indeed it is possible to correct and that assumes the current model is correct. What I believe is that it is like the Joint Strike fighter from L0ckheed that does not work right and will probably never work right until a firm decision is made to limit what this wonder craft is actually supposed to do. To many chiefs and an incompetent in charge at Lockheed a bit to worried over social justice corporate policies and affirmative action over ability and making promises to government officials they can’t keep. And get rid of the “expensive” old dudes who know what they are doing so they can be replaced with young ones who don’t. But hey, it keeps the bucks rolling in and for the lobbyist expenses to keep the crony stuff happening it is wildly profitable. Short term that is. But like the software programs where promises are made and insufficient staff and to many promises made to fulfill them by things grind slowly into various states of disarray and poor functioning. The customer gets it in the end of course. What is really new in the last four or five years in CAD CAM? I mean revolutionary in its new found efficiencies and productivity for the end-user? The last thing I really got excited about was Synchronous Tech with Solid Edge but there to it is now refinements and not leaps forward as it once was. I really like using HSM and since I am not a four axis plus nor a turning center shop its shortfalls do not concern me at all. It is the best high-speed machining algorithm out there but once again how many years ago was the break through and nothing nearly as profound since. As an aside here about HSM. I have met some of the developers behind this program. They are brilliant. I can only conclude in observations and dot connecting that the long time shortfalls in this program are because Autodesk has as it’s most important CAM goal the creation of a Fusion 360 robust enough to eventually force the vast majority of all who want to use Autodesk CAM products there. So that is where the time and money apparently is going. Autodesk has the money and ability to solve HSM problems quickly if they wished to and the existence of problems going back four and five years indicates decisions being made regarding priorities. This is my opinion and not something I have been told is their direction. Today’s corporate version of new and improved is just that. Corporate BS meant to use buzz words and glossy promos to people who either don’t understand the ramifications or even worse don’t seem to care. Like millennials who want to own nothing and have no ownership responsibilities and cant grok the future they are making for themselves as permanent chattel. Of course this refers to this cloud garbage whose sole intent is to increase profit for the authors. Fusion360 is what really started me thinking about this only “new innovative” technology out there according to the shills. I was very interested until I found out you HAD to save and edit parts with a mandatory online link to a remote server and with subscription only software to boot. Now the price of admittance is dirt cheap. Just like the unlimited data cell phone plans were until they got enough people in and then expenses jump. One of the future ways I believe Fusion is going to gouge you is already in the works. You can get rendering done on Autodesk’s cloud with cloud credits you purchase. I have no idea what you get for this and don’t intend to ever ask since I am not going there. But in the near future you will see data caps for online storage amounts and it will I believe include data transferred to edit and update files online and then data caps on the amount that is archived online. This level will over time drop until they find the sweet spot where they start losing customers and then they will back up a bit from there. Nothing is free and by then for all who go there leaving your captivity will be hard. So the only “new” thing for the last few years is a big fat negative for forward-looking users. Onshape and Fusion 360 and any other program that demands online to work is tailor-made for suckers who do not care to research the past where mainframe compute problems gave rise to the freedom of power at your fingertips with desktops and precise control over expenses and outgo. As far as I can tell the only technology push this coming year will be to figure out ways to make your existing customers captive. Cheap to start and then when you can never leave the price to play will magically grow onerous. Funny how that works isn’t it?